Following the launch of grocery delivery by Amazon at Whole Foods through its Prime Now program, Walmart announced on Monday it was rolling out an option for its grocery delivery and pickup service that is meant to entice busy families: meal kits. An affordable alternative from the retailer, to subscriptions to meal kit delivery programs such as Blue Apron, is available at this time in over 250 stores, and will be available through its grocery pickup service that is available online. The meal kits are going to be available in more than 2,000 locations at Walmart by the end of year, said the company. The new kits have been developed by the Culinary and Innovation Center at Walmart, and have pre-portioned ingredients that accompany the rotisserie chicken or are a help to users for preparing a fast meal without needing to chop veggies, mix ingredients or add seasonings. The kits are similar to those found at the majority of grocery stores today and are prepared fresh each day at stores and sold through the deli. The meals have been designed to feed two and range in prices from between $8 and $15. The kits have rotisserie chicken meals (Chicken Fried Rice and Thai Curry Chicken); kit meals that are pre-portioned (Basil Garlic Chicken, Steak Dijon, Pork Florentine and Sweet Chili Chicken Stir Fry); and One Step Meals such as Cheesy Ravioli, Chicken Alfredo, Spaghetti, Chicken Parmesan, Meatloaf and more. A spokesperson for Walmart said that customers today are busier than they ever have been and Walmart knows that getting delicious meals onto the table is difficult and are here to help. The meals, added the spokesperson, give cooks a new, easy, fresh option for dinner during the week. With ordering online, customers who place an order in the morning or prior to lunch will have the option of picking the kit up from the company’s curbside grocery service prior to dinner. In certain markets, online customers can choose delivery of the kits as well. However, Walmart does not operate a grocery deliver service of its own, as does Amazon and Target. As it contracts third parties such as Uber and shoppers are charged a fee during checkout. At this time, delivery is only available in six markets or 40 stores. The meal kits made by Walmart are not the only easy food/meal kit option from the company. 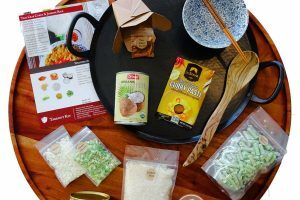 Last year Walmart launched a specialty food and meal kits site that features kits from its partners Takeout Kit and Home Chef.